Why bother with a glass? Courtesy of LA Wine Fest. 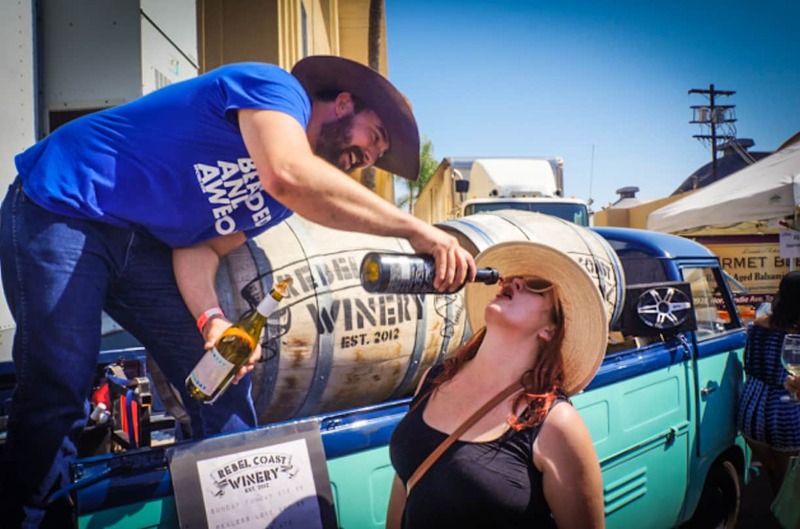 After serving the formal community of Los Angeles for over a decade, the 14th annual LA Wine Fest will have a Long Beach showing at The Pike Outlets on June 1 and 2. The massive event catering to everyone’s inner oenophile—one that provides unlimited pours upon entry of both beer and wine—has attracted 5,000 attendees annually and is expected to draw the same numbers for its debut in Long Beach. * A special ticket is required. Rev Winery & Brewing Co.
And then there’s the food, which includes Coolhaus (known for its architecture-inspired ice cream sammies), Cousins Maine Lobster (the truck offshoot of the restaurant just launched in Los Angeles and offers everything from lobster tots to lobster tacos), Goshen Cuisine (known for their sushi burrito), Slammin’ Sliders (with a seemingly endless list of sliders, and The Berlin Truck (known for their takes on grilled cheeses and sausages like their curry chicken grilled cheese and mac’n’cheese dog).